This article is about life support systems used during manned spaceflight. The Primary (or Portable) Life Support System (PLSS) from the Apollo A7L space suit, with its outer cover removed. Carried as a "backpack" by the astronaut, it provides many of the functions of a spacecraft's life support system. In human spaceflight, a life support system is a group of devices that allow a human to survive in outer space. Such a system normally supplies the astronaut with air, water, and food, helps maintain an appropriate body temperature and pressure, and deals with the body's waste products. It may also shield the person against harmful external influences such as radiation and micrometeorites. Components of the life support system are life-critical and are constructed using safety engineering techniques. NASA often uses the name Environmental Control and Life Support System, or the acronym ECLSS, when describing these systems for its human spaceflight missions. A crew member of typical size requires a total of approximately 5 kilograms (kg) of food, water, and oxygen per day to perform standard activities on a space mission, and puts out a similar amount in the form of waste solids, waste liquids, and carbon dioxide. The mass breakdown of these metabolic parameters is as follows: 0.84 kg of oxygen, 0.62 kg of food, and 3.52 kg of water consumed, converted through the body's physiological processes to 0.11 kg of solid wastes, 3.87 kg of liquid wastes, and 1.00 kg of carbon dioxide produced. These levels can vary due to activity level, specific to mission assignment, but will correlate to the principles of mass balance. Actual water use during space missions is typically twice the specified values, mainly involving non-biological use (that is, personal cleanliness). Additionally, the volume and variety of waste products varies with mission duration to include hair, finger nails, skin flaking, and other biological wastes in missions exceeding one week in length. Other environmental considerations such as radiation, gravity, noise, vibration, and lighting also factor into human physiological response in space, though not with the more immediate effect that the metabolic parameters have. Space life support systems provide atmospheres composed primarily of oxygen, nitrogen, water, carbon dioxide, and other trace gases. The partial pressures of each component gas additively combine to the overall barometric pressure, typically 101.3 kPa (Earth standard atmospheric pressure at sea-level). However, atmospheric pressure can be significantly lower (25-26 kPa for EVAs) given a corresponding increase in the partial pressure of oxygen. Lower atmospheric pressures are advantageous for designing spacecraft with less structural mass and reduced atmospheric loss. The two primary ways of achieving this are by reducing atmospheric pressure while keeping the percent of oxygen the same (~21 percent) or through allowing the oxygen concentration to remain at sea-level pressure while reducing the overall barometric pressure. Water is consumed by crewmembers through drinking, cleaning activities, EVA thermal control, and emergency uses. It must be stored, used, and reclaimed (from waste water) efficiently since no in-situ sources currently exist for the environments reached in the course of human space exploration. Life support systems often include an indoor plant cultivation system which allows food to be grown within buildings and/or vessels. Often, the system is designed so that it reuses all (otherwise lost) nutrients. This is done in practice by for example composting toilets so which reintegrate waste material (excrement) back into the system by allowing the nutrients to be taken up by the food crops. The food coming from the crops is then consumed again by the system's users and the cycle continues. The NASA LOCAD (Lab-on-a-Chip Applications Development) project is working on systems to help detect bacterial and fungal growths in spacecraft used for long-duration spaceflight. For the Space Shuttle, NASA includes in the ECLSS category systems that provide both life support for the crew and environmental control for payloads. The Shuttle Reference Manual contains ECLSS sections on: Crew Compartment Cabin Pressurization, Cabin Air Revitalization, Water Coolant Loop System, Active Thermal Control System, Supply and Waste Water, Waste Collection System, Waste Water Tank, Airlock Support, Extravehicular Mobility Units, Crew Altitude Protection System, and Radioisotope Thermoelectric Generator Cooling and Gaseous Nitrogen Purge for Payloads. The Orion crew module life support system is being designed by Lockheed Martin in Houston, Texas. The life support system on the Soyuz spacecraft is called the Kompleks Sredstv Obespecheniya Zhiznideyatelnosti (KSOZh). In May 1996, NASA published Technical Memorandum 108508, the International Space Station ECLSS Technical Task Agreement Summary Report. It covers work done to develop and test both water recovery and air revitalization systems for the ISS. The diagram below shows the general functions of the life support system for the ISS. The ISS has two water recovery systems. The Zvezda contains a water recovery system that processes waste water from showers, sinks, and other crew systems and water vapor from the atmosphere that could be used for drinking in an emergency but is normally fed to the Elektron system to produce oxygen. The American segment has a Water Recovery System installed during STS-126 in the U.S. Lab that can process water vapor collected from the atmosphere, waste water from showers, sinks, and other crew systems, and also urine into water that is intended for drinking. The Water Recovery System consists of a Urine Processor Assembly and a Water Processor Assembly. The Urine Processor Assembly uses a low pressure vacuum distillation process that uses a centrifuge to compensate for the lack of gravity and thus aid in separating liquids and gasses. Water from the Urine Processor Assembly and from waste water sources are combined to feed the Water Processor Assembly that filters out gasses and solid materials before passing through filter beds and then a high-temperature catalytic reactor assembly. The water is then tested by onboard sensors and unacceptable water is cycled back through the water processor assembly. The Volatile Removal Assembly flew on STS-89 in January 1998 to demonstrate the Water Processor Assembly's catalytic reactor in microgravity. A Vapor Compression Distillation Flight Experiment flew, but was destroyed, in STS-107. The Water Recovery System failed during the first tests and required astronauts to remove several rubber vibration isolators as the way the system was configured when it was first installed caused balance issues with the centrifuge in the vacuum distillation assembly that resulted in it failing with an error code after two hours of use. Six liters of water will be returned with STS-126 to calibrate the on-board analysis and after running successfully for 90 days, the station will be able to support an additional three astronauts. 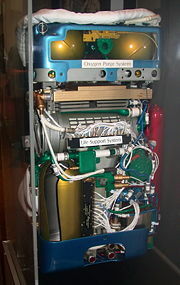 The Oxygen Generating System (OGS) currently used aboard the ISS (International Space Station) is the Elektron, located in Zvezda. Destiny also contains an OGS which is not yet in use. Initial use of the Destiny OGS is planned for late Summer, 2007. During one of the spacewalks conducted by STS-117 astronauts, a hydrogen vent valve required to begin using the system was installed. Additionally, the ISS crew has sometimes used backup sources of bottled oxygen and Solid Fuel Oxygen Generation canisters. The OGS aboard Destiny will electrolyze water from the Water Recovery System to produce oxygen and hydrogen. The oxygen will be delivered to the cabin atmosphere and the hydrogen will be vented overboard. Extra-vehicular activity (EVA) systems primarily consist of the traditional space suit, but can also include self-contained individual spacecraft. Both space suit models currently in use, the U.S. EMU and the Russian Orlan, include Primary Life Support Systems (PLSSs) allowing the user to work independently without an umbilical connection from a spacecraft. A space suit must provide life support, either through an umbilical connection or an independent PLSS. ↑ Sulzman and Genin (1994). ↑ NASA, Preventing "Sick" Spaceships. Retrieved January 11, 2009. ↑ NASA, Breathing Easy on the Space Station. Retrieved January 11, 2009. ↑ NASA, HSF—The Shuttle: Environmental Control and Life Support System. Retrieved January 11, 2009. ↑ NASA, International Space Station ECLSS Technical Task Agreement Summary Report. Retrieved January 11, 2009. ↑ NASA, International Space Station Environmental Control and Life Support System. Retrieved January 11, 2009. Eckart, Peter. 1996. Spaceflight Life Support and Biospherics. Torrance, CA: Microcosm Press. ISBN 1881883043. Larson, Wiley J., and Linda K. Pranke (eds.). 1999. Human Spaceflight: Mission Analysis and Design. New York, NY: McGraw Hill. ISBN 007236811X. Sulzman, F.M., and A.M. Genin. 1994. in Nicogossian, Arnauld E. (ed.). 1994. Space, Biology, and Medicine. Vol. II: Life Support and Habitability. Washington, DC: American Institute of Aeronautics and Astronautics. ISBN 9781563470820. Environmental Control and Life Support System NASA-KSC. Dedication and Perspiration Builds the Next Generation Life Support System NASA, Fall 2007. Light, plants, and power for life support on Mars. History of "Life support system"
This page was last modified on 6 July 2018, at 16:33.